"Ia Ora 'O Tahiti Nui"
21 Jul 1595 Marquesas Islands discovered by Spanish Capt. Byron and named Isles of Disappointment. and named King George's Island by him. 13 Apr 1769 British Capt. James Cook arrives aboard H.M.S. Endeavour at what he calls "Otaheite." to France; other islands are annexed until 1900. 9 Sep 1842 `o Tahiti (Tahiti) a French protectorate. King Pomare V (ratified by France 30 Dec 1880). 6 Mar 1881 `o Paro (Rapa) annexed by France. 5 Jul 1881 Mangareva and Gambier Islands annexed by France. 16 Mar 1888 Ra`iatea, Taha`a, and Huahine annexed by France. 19 Mar 1888 Porapora (Borabora) annexed by France. 25 Aug 1900 Rurutu in Austral Islands annexed by France. 2 Sep 1901 Rimatara in Austral Islands annexed by France. (from 2 Sep 1940, under Free French). 27 Oct 1946 French overseas territory of France. 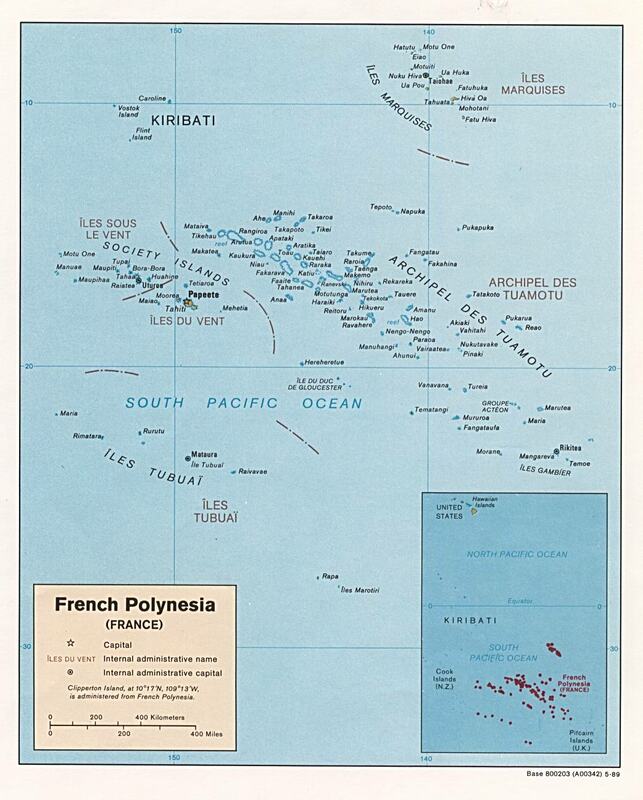 22 Jul 1957 French Polynesia (Polynésie Française). 12 Jul 1977 Limited autonomy. 9 Sep 1984 Autonomy increased (from 29 Jun 1984 law). 28 Mar 2003 French overseas collectivité. loose leadership of an ari`i rahi (called king by the Europeans). 9 Sep 1842 `o Tahiti a French protectorate. their Dependencies"; accepts French protectorate 1 Jan 1847. Pomare V (ratified by France 30 Dec 1880). as the legendary center of Polynesian dispersion. up to that date had been fragmented into several districts. 1857 Annexation by 'o Tahiti. 16 Mar 1888 Annexation by France. c.1500 Porapora, also called Vavau, has a lineage of rulers. 19 Mar 1888 Annexation by France. 15 Sep 1895 Royalty terminated. c.1800 Aureka lineage becomes the ruling Ngaitapana dynasty. 6 Mar 1881 Annexation by France, but kingship continues. 18 Jun 1887 Kingship abolished. 16 Jan 1844 Ma`areva (Mangareva) a French protectorate. 5 Jul 1881 Annexation by France. 1814 Claimed by David Porter for the U.S., but claim is not ratified. 3 - 26 Jul 1835 Abortive Kingdom of Nuku Hiva proclaimed by French adventurer. 1 May 1842 Chiefs of the Marquesas Islands cede sovereignty to France. Jun 1901 Annexed by France. 2 Sep 1901 Annexed by France. 25 Aug 1900 Annexed by France. 1 May 1842 French protectorate. Apr 1880 Annexed by France. other islands are annexed to 1900. 27 Oct 1946 Overseas territory of France. 28 Mar 2003 Overseas collectivité (collectivity). 27 Feb 2004 Overseas country.